OWL - a future milestone for Astronomy? OWL will operate in open air and be covered by a sliding enclosure during daytime. With a diameter of 100 meter, OWL would combine unrivalled light gathering power with the ability to resolve details down to a milli-arc second. A crude simulation showing images of the same object as seen by existing facilities and by OWL. OWL angular resolution will be 40 times better than that of the Hubble Space Telescope. With the present generation of 8 to 10 m class telescopes well along the way, a number of astronomical Institutions are now starting to work towards the next generation of Extremely Large Telescopes (ELT). Detailed Science Studies have shown that giant collectors - 25-m diameter up- working near their diffraction limit (a hundredth to a few thousands arc-second on the sky) are indeed needed for the next major advances in the knowledge of the Universe we live in. OWL design relies extensively on serially produced modules. Most current ELT projects are up scaled versions of the segmented Ritchey-Chrétien concept, successfully pioneered in the early 90's with the twin 10-m diameter Keck telescopes located on top of Mauna Kea, Hawaii. Since 1997, ESO has worked in close cooperation with European Industries on an original concept, with the goal of breaking the steep cost to diameter law of this classical approach. OWL relies on a paradigm change: while nearly all telescopes in the past have been built as one-off prototypes, OWL is based on mass production of the major cost items, notably the overall mechanical structure with modular building blocks (as pioneered by Gustave Eiffel in 1899 for his eponymous tower) and spherical primary segmented mirror (pioneered by the Hobby-Eberly Telescope in the 90s). This results in a cheap structure, extremely light but with high performance, as well as low-cost, yet very high quality optics. The OWL study was completed and subsequently reviewed by an international panel of experts in the fall of 2005. Design and analysis validate the concept as a cost-effective and time-effective way to build any ELT significantly larger than 60m. In particular, we found a much more hopeful cost to diameter relationship. The review panel concurred with the soundness of the concept. However, in view of the global cost and the huge technological development needed, with significant cost and schedule risks, it recommended to study instead a less ambitious 30 - 60m facility - the European ELT. 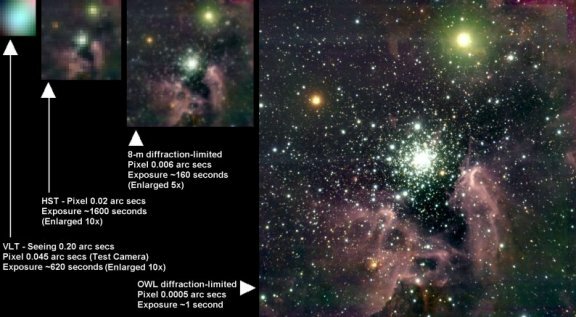 OWL will provide detailed observations of the farthest objects..
With its keen angular vision, OWL will be capable of imaging solar system objects at resolutions comparable to that offered by space probes, but over much longer time scales. It will unveil the intricate processes underlying the formation of stellar and planetary systems, not only in our own Galaxy but also in many nearby ones. Even more important, and in combination with its huge light gathering power, OWL should shed light on the two major cosmic mysteries of our time, of whether there are life-bearing planets like our own around other Suns, and on the meaning of the enigmatic dark matter and dark energy which in toto make up 96% of the mass content of our Universe. 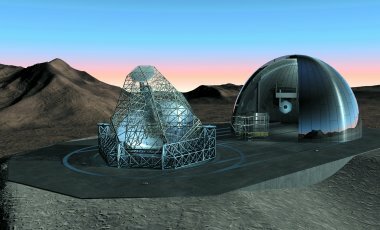 OWL will be able to image exo-planets and determine their atmospheres' composition, and thereby, possibly, reveal the existence of biospheres. It will peer into the deepest reaches of the Universe and witness the birth of the very first stars and galaxies. As illustrated in the figure above and through its direct view of star formation history back to the very first stars to have ever exploded, it will probe the laws of physics at an energy scale unreachable with the largest particle accelerator. If the past history of every generation of telescope holds true, the most important discoveries awaiting OWL could very well happen in new, unanticipated, areas. It may, eventually, revolutionize our perception of the Universe as much as Galileo's telescope did. Although designed for 100-m diameter, OWL is a concept with a wide range of applicability. A preliminary analysis shows that the upper limit for the concept is in the range of 130 meters. This limit is essentially set by the fact that with larger diameters, monolithic relay mirrors beyond proven dimensions (about 8-m) would probably become necessary. In addition, safety with respect to dynamic excitations (wind, earthquakes) and fatigue would probably imply a structural design relying extensively on expensive composite materials -whereas the OWL structure is made of standard steel. The lower size limit is in the 60-m range, below which simpler optical solutions become attractive. The modular approach can break the time-honoured Time versus Diameter law of approximately 1 year per 1-m of diameter, which by itself would practically prohibit the construction of any Telescope much larger than about 10-20 m. Another crucial feature of the mass production approach is that it leads naturally to the "growing a Telescope" scheme, with early opening of the facility for science observations significantly before start of full operation. Indeed, existing segmented telescopes were already turned to the sky before the integration of segments was complete, mainly for engineering work. 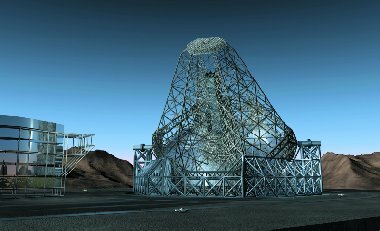 With "only" a quarter of its 3048 segments integrated, OWL would already perform as a 50-m class telescope and thus deliver unequalled science performance 3 to 4 years before before full completion. The total estimated cost of OWL is about 1,200 millions of Euros, including 940 million Euros in capital investment. Industry has played and is still playing a key role in ESO projects and its involvement right from the early phases of a new project is considered as essential. European industry deserves substantial credit for the excellent performance of ESO's 8m Very Large Telescopes. The VLT project has been equally benefitial to suppliers, in the form of profitable spin-offs or by promoting them to world-leaders in their respective fields. In the case of OWL, the project size and its general reliance on low-risk, serially produced components add to the incentives for industrial participation. The OWL concept study was supported by quite a number of industrial studies. These studies confirm internal cost, schedule and performance estimates, as well as the unequivocal interest of potential suppliers to be associated with the project.